To understand the complicated path for Subaru’s first plug-in hybrid, first we needed to hike a mile in the automaker’s shoes. OK, more like 10 miles, actually—driving the 2019 Subaru Crosstrek Hybrid gingerly up a dusty, bouldered, steep trail, past signage cautioning: “off-road vehicles only,” most of it without the gasoline engine running. Tenacious all-weather, all-wheel drive capability are the foundation for Subaru’s success in the U.S. So in its first plug-in vehicle for widespread sales, Subaru wanted to provide the same driving behaviors and basic traction ability whether operating on its all-electric plug-in mode or in hybrid mode, with the combustion engine off or on. And they wanted to make clear that the car doesn’t have to be plugged in. DON'T MISS: All-electric Subaru crossover utility vehicle coming in 2021? 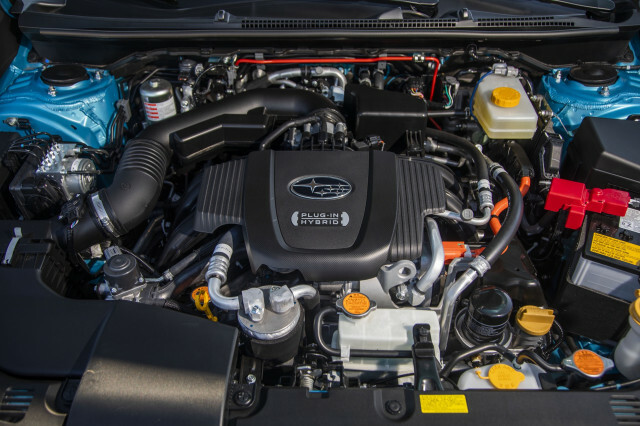 To achieve that Subaru resorted to Toyota’s proven hybrid system, used in its front-wheel-drive vehicles like the Prius and Camry, and adapted it for its flat-4 engine, mounted 90 degrees differently (lengthwise vs. crosswise). Then fighting Toyota convention—which would have been adding an e-motor to the rear wheels, as in the RAV4 and Highlander hybrids—Subaru gave the Crosstrek a propshaft to the rear wheels (with an electric coupling to divvy it up front-to-rear) and made it part of a tough, mechanical all-wheel-drive system. 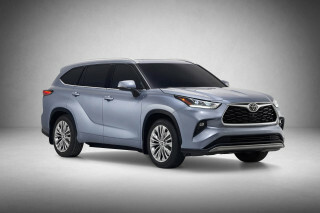 It’s a setup that closely echoes the approach used with the automaker’s continuously variable transmission (CVT) vehicles, with Toyota’s entire hybrid transmission—its dual motors and wizardry of planetary gearing intact—transplanted in place of the CVT. Cross a CVT Crosstrek with a Prius Prime, add more dynamic spark that’s missing in the Prime (but forgo the option to lock out the gasoline engine), and you end up with the Crosstrek Hybrid. Since the torque and power peaks don’t match up, the net result is greater than what the powertrain’s total system output of 148 horsepower suggests. As Subaru pointed out, the last Crosstrek with a Hybrid badge had a 13-hp electric motor. This one has an 118-hp motor. And that’s just the one that provides the main tractive power and assistance. This Crosstrek Hybrid can be on electric power often, and it actually feels quicker, more refined, and more “premium” than the standard Crosstrek. So it’s more than a feel-good badge. 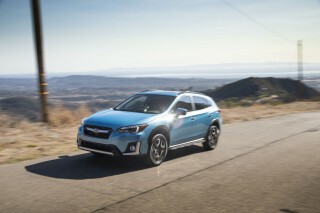 The 2019 Crosstrek Hybrid is about a second quicker to 60 mph than the 2019 Crosstrek and the difference feels even more pronounced in quick passing maneuvers. As the Subaru flat-4 rises in and out of the mix in hybrid operation, the Crosstrek Hybrid has a familiar Boxer-thrum sound, but one that feels mostly disconnected from the power flow. 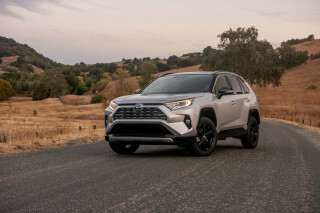 The 2.0-liter engine under the hood is the same size as what’s in the standard Crosstrek but with a different valvetrain, crankshaft, and a few other changes to fit it for the efficiency-minded Atkinson cycle. The engine makes 137 hp and 134 pound-feet in the Hybrid, versus 152 hp and 145 lb-ft in the Crosstrek. 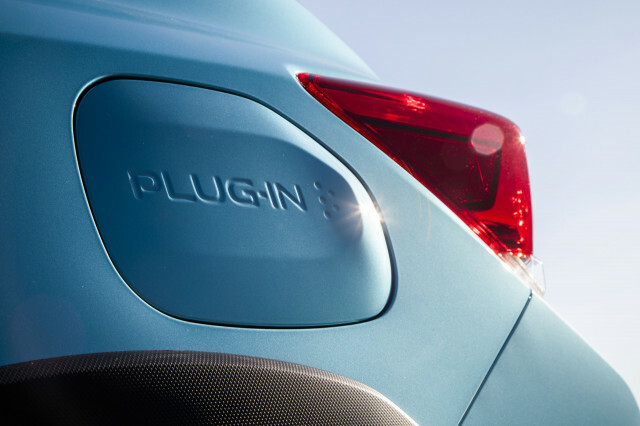 Peak torque for the gas engine comes at 4,400 rpm in the Hybrid. For one motor—the one making 118 hp and 149 lb-ft of torque—forward thrust is the primary task. 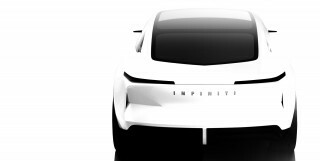 It supplements the gas engine, moves the vehicle in its all-electric plug-in mode, or sends power back to the battery during regenerative braking. The other motor functions mostly as a generator (and as the starter motor), helping store away charge in the battery. This unit is used to its greatest capacity when you press and hold the HV/EV button to access Charge mode. That runs the generator as much as possible, pushing 20 kw at times, depending on driving style, to build back up the battery’s “plug-in” charge. Some automakers—Hyundai/Kia, for instance—have abandoned such a mode in future models because of the added fuel consumption and strain on emissions components. But it gives owners another option—to charge the battery when driving, so that they can keep tailpipe emissions (or perhaps engine noise) out of their garage, driveway, or neighborhood. We recovered two-thirds of a charge in about 45 minutes of driving on two-lane backroads and found that charge mode kept the engine working with more coarse, strident tones along the way when it was engaged. Once you gain some charge, you can toggle the button again and use Save mode to keep it for later. The Crosstrek Hybrid doesn’t ride or corner any worse for 487 added pounds of weight versus the non-hybrid Crosstrek. To cope with more weight on the rear wheels—the Crosstrek Hybrid has unique spring and damper tuning, as well as a slower steering ratio than the standard Crosstrek. 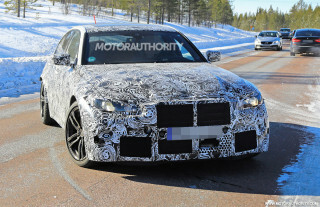 Although it’s hardly sporty, we found reasonably good, safe handling, well-coordinated for quick esses and lane-changes. Subaru also notes that since the system has brake regeneration through all four wheels that it’s inherently more stable during moderate braking. Rear brakes are upgraded in the Hybrid; but the system can recover up to 40 kw via regenerative braking from all four wheels, and in real-world driving it does up to 80 percent of the work. Its brake blending felt extremely smooth as we came to the final few feet of a stop. The battery pack is the same size as the one in the Toyota Prius Prime—8.8 kwh, with not much more than 6 kwh reserved for plug-in operation. 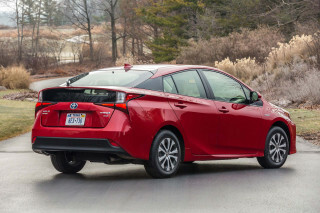 It yields 17 EPA-official miles of range (significantly less than the Prius Prime’s 25 miles), with 35 mpg combined, according to the EPA, when there is no plug-in charge remaining. On a steep drive route that took us out of EV mode within a few miles, we were unable to comment on real-world range. Anecdotally, once we’d used a charge we saw mpg figures in the low 30s according to the trip computer—or low 20s in Charge mode. The Crosstrek Hybrid charges up in five hours on 120-volt AC, with the included adapter, or about 2.5 hours at 240 volts (L2) on a commercial or home-installed charger. But as with many other plug-in hybrids on the market, you need to learn the parameters of how to stay in EV mode—and they’re a bit complicated. If you want to keep all-electric once you’ve charged, there are some things you’ll need to know. You can’t exceed 65 mph or half throttle. The temperature of the engine coolant can’t be below 14 degrees F either. 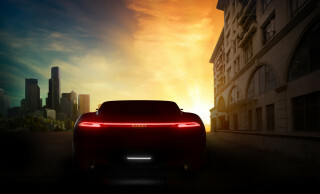 Once you’ve triggered the gasoline engine to go on—provided there’s still adequate plug-in charge—you have to jump through some hoops to return to the all-electric side of things. 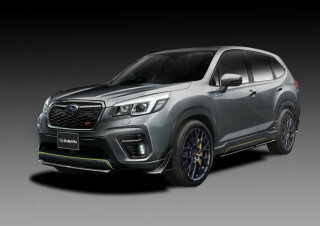 You’ll need to keep under 62 mph and one-third throttle; and you may need to wait a few minutes as it has to bring the coolant temperature past 104 degrees F. And the battery temperature has to be above 10 degrees F.
Subaru made the heating resistive, and the engine doesn’t have to start up to provide climate control. 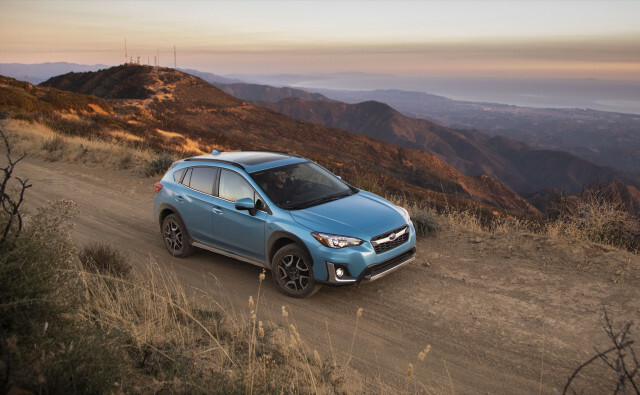 From the outside, little differentiates the Crosstrek Hybrid from the Crosstrek; look for blue headlight accents, badging, a Hybrid-exclusive Lagoon Pearl blue hue, and a charging door that pushes outward from the surrounding sheetmetal a fraction of an inch to flaunt its capability. Inside, there’s Hybrid-exclusive blue-tone trim for the dash and doors, and some added blue stitching for the seats (and a two-tone theme). In cabin packaging, the Crosstrek Hybrid gets an electric parking brake instead of a pull-handle; the cupholder changes orientation to a side-by-side layout; and for the battery there’s a step up of a few inches for most of the cargo floor behind the rear seats. It drops the cargo space to 15.9 cubic feet in the Hybrid, as opposed to 20.8 cubic feet in non-Hybrids. Likewise, that “battery hump” drops the total when you fold the rear seatbacks forward from 55.3 in the standard model to 43.1 in the Hybrid. The Crosstrek Hybrid has the same 8.7 inches of ground clearance, and Subaru says that the Crosstrek Hybrid has an advantage over the Crosstrek in at least one situation: slippery uphill on-road instances, where the nuanced, strong torque delivery of the motor allows a smoother launch. The roof will accept static loads of up to 700 pounds and dynamic loads (via conventional roof racks) of up to 150 pounds. And it can tow 1,000 pounds. Even though the Crosstrek Hybrid has a gas tank that’s 3.4 gallons smaller than the standard Crosstrek (13.2 gallons total), it has virtually the same driving range: 480 miles. The difference between Intelligent and Sport modes is mainly a matter of accelerator mapping, and X-Mode is transferred from the standard Crosstrek. Press the button and it coordinates the powertrain, all-wheel drive, and brakes for the best low-speed stability. 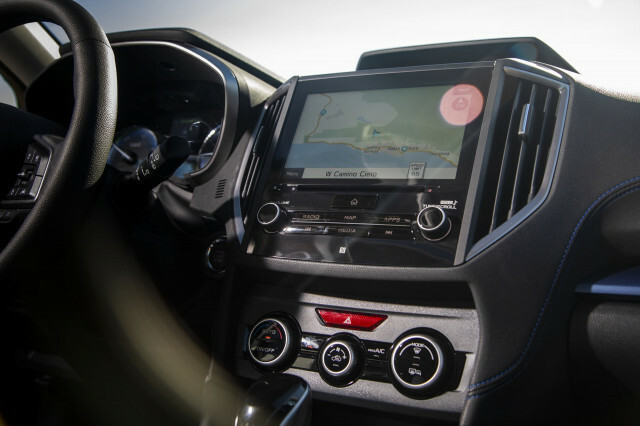 The Crosstrek Hybrid comes with equipment that mostly matches the Premium-level Crosstrek model, including automatic climate control, heated front seats, heated mirrors, a wiper de-icer, and an 8.0-inch infotainment system with Apple CarPlay and Android Auto compatibility. An upgraded system with navigation and eight-speaker Harman Kardon audio is available. The suite of EyeSight driver-assist features—including adaptive cruise control, lane-departure warning, active lane control, and pre-collision braking—is standard on the Crosstrek Hybrid. Furthermore, a set of connected services (with a 10-year free subscription) allows owners to remotely do a number of tasks like check the battery charge remotely or precondition the cabin. 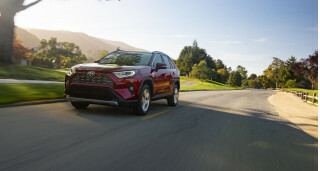 The 2019 Crosstrek Hybrid, which is offered as a single trim level as opposed to Subaru’s other models, costs $35,970, but the Hybrid qualifies for a $4,500 tax credit that drops the price down to $31,470. While that’s still far from the $22,870 that a base Crosstrek 2.0i costs, or the $24,870 for a 2.0i Premium, it’s about a $5,000 premium over a similarly equipped 2.0i Premium with EyeSight to roughly match the Hybrid’s equipment. Here’s where that sturdy trail shoe drops: Subaru is only making the Crosstrek Hybrid available (with first deliveries before the end of the year) in California, Connecticut, Maine, Massachusetts, Maryland, New York, New Jersey, Oregon, Rhode Island, and Vermont—yes, CARB ZEV states—although it says that dealerships across the U.S. can sell them if they choose to. Officials didn’t say how many they would build. Although that sounds like grounds for dismissal of the Crosstrek Hybrid as a compliance car, the flip side is that (outside of the clunky battery packaging) this vehicle doesn’t feel like a half-baked, one-off effort. Collectively, Subaru is calling its hybrid/AWD system StarDrive and won’t deny that we’ll be seeing more of the system in its other models, almost entirely built on the same platform now. Subaru made a very smart choice in going nearly all all-wheel drive decades ago; going all plug-in AWD could be an even smarter move. Internet Brands Automotive accepted some travel expenses from Subaru to bring you this firsthand drive report.